Hey my beautiful Mindfoodists, happy Friday. I set myself the goal to be more consistent with my blog posts this year, so I am going to try my best to post a recipe every week. Monday at 12 pm European time ideally. Im not sure how this is going to end, but I promise I will try my best. Another thing, and I am talking directly to you reading this right now. I know for a fact that people read my blog, because I get messages on Facebook. First of all YAY, and second, since almost everyone has a Google Account, either because of Youtube, Gmail or whatever else there is, please take a minute to Follow me officially on here so we could build a little army & to keep me accountable. I would also love to know if any of you have tried cooking anything from mindfood.cc, or if I have inspired you to eat more plant-based. The feedback would really help me better my blog & my recipes. So since me speaking of dead animals probably made you salivate and really hungry let me get to the recipe. 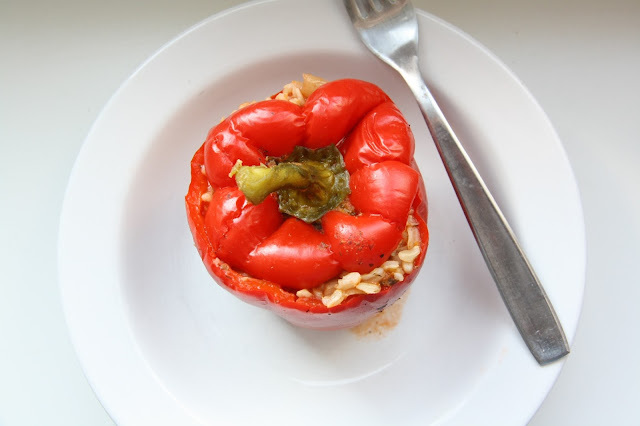 So the most difficult bit about this recipe is probably cutting open the bell peppers, and since that isn't particularly hard to do, you won't be freaking out over this one. Cut off the top bit, and scoop out any seeds or white bits. Cut off the seeds off the top and then set them aside. Fill a pot with 1 cup of water mixed with 1 cup canned tomato sauce and heat it. Cut your onion & garlic and mix it, in a big bowl, with the rice the 1/4 cup tomato sauce/diced tomatos, tbsp of olive oil, herbs and tomato paste. Fill the peppers to the top and put the little hat back on. Then place them CAREFULLY in the pot, preferably so that they can't fall over, and put the top on the pot. Cook over low heat for 1 hour.